The Andanuth is the many-storied tale of the world of Aihrde, from its beginning in the depths of the Void, through the rise of the Val Eahrakun, to the age of the Young Kingdoms. A saga like few others it brings the reader on a journey of epic wonder. Told in seven parts, this collection of tales renders the world complete in all its manifold forms, from the evil to the sublime, from the noble to the mad. Rich in depth and mythology, a whole world’s history unfolds. Part 1 The Days before Days: Of the beginning of days. The dragon upon the Void and the Maelstrom. Of the Val Eahrakun and their wars. When the All Father made the world upon the face of the Void and unfurled the Arc of Time. Of the gods in their youth and the creation of Aihrde, the world to be. This is accounted the First Rin upon the Arc of Time. Part 2 Of the Beginning of Days: Wherein the All Father grants life to the dwarves, the men, and giants. The rise of the Red God and the fortifying of time and his contests. Of the coming of the merfolk and the love of gods. This iand the fortifying of time and his contests. Of the coming of the merfolk and the love of gods. This is accounted the Second Rin upon the Arc of Time. Part 3 Songs of the Dwarves: Wherein the dwarves order their world to repay the Debt of Life. Of the coming of the goblins and the worth of men. The fall of Mordius and the Red Cloak and the rising might of the Red God. Of the long wars and the lamentations. This is accounted the Third Rin upon the Arc of Time. Part 4 The Dwarven Laments: These are the days of sorrow and loss, when all that came before changed forever. The power of the Folk waned and men rose. It is the end of the glories of the Days before Days. This is accounted the Fourth Rin upon the Arc of Time. Part 5 Of the Age of Man: Wherein men assume the mantle of the world. Herein the Ethrum came and the Aenocihans. Of the rise of gods and the reordering. Of sorcery and the age of wizards. The rise of the God-Emperors and the Aenochian Empires. This is accounted the Fifth Rin upon the Arc of Time. Part 6 Of the Age of Winter Dark: An account and History in brief of the Millennial Darkness, the Winter Dark also called the Long Centuries; of the Warping of the World, the Binding of the Twin Sisters; the myriad wars of Unklar, the Horned Go; of Aufstrag and the coming of Hell; the Mogrl and other beasts; of the Winter Dark Wars. This is accounted the Sixth Rin upon the Arc of Time. Part 7 After Winter Dark: Being an account of the beginning of days after the fall of Unklar and the diminishment Aufstrag. The rise of Kayomar and New Aenoch and all the Young Kingdoms. Held to be the last before the Gonfod. This is accounted the Seventh Rin upon the Arc of Time. The Ethrum traveled a different path then the Engale, for few remained in the north after the fall of the Harlking Halls. Those that did grew wild, living in small bands and their deeds, great and small, passed out of history. The majority of them moved south, following parallel roads to the Aenchians, until they came to a great chain of mountains, the Holmgrad. There, they parted from their kin and moved to the west and south where they came to another long chain of mountains. Some followed these mountains south, hemmed in between that country and the wilds of the Dulcet. Others passed between those mountains, the Shadow Mountains and the Holmgrad, through what later was known as the Kleberock Pass, to come to the western Lands of Ursal. Here, they settled along the western shores of the Inner Sea, building long houses in the open country. But they soon learned that this land was the haunt of the stone giants, and the giants did not welcome them. Worse, the dragons that dwelt in the mountains came forth to hunt them, and they hounded the Ethrum for sport and food. So the Ethrum moved south, east of the Bleached Hills, until they came to the open country north of the Bergrucken Mountains. Some moved further east and had contact with dwarves that dwelt upon the Sea of Shenal, in and around the large town of Ursal. The bulk of them, however, moved south between the hills and mountains. Those lands were occupied by the dwarves of Norgorad Kam, whose great kingdom lay in the Bergrucken. The dwarves welcomed the Ethrum only grudgingly: they remembered them as kin from long ago, but wondered where they had come from. They had only rumors of the deeds of Ornduhl in the Halls of Argrind and the Harlking Halls, and they cared not for the meddling of the gods of men, and for these reasons and others, they kept these newcomers at a distance. The dwarves forbid the Ethrum access to the mountains, laying claim to those, even to the sparsely populated north and west. They granted them all the lands between the Bergrucken and Rhodope Mountains, where the mighty Ethvold forest stood, barring them only from the roads and houses of the dwarves that lay in that forest. In those days the Ethvold dominated the greater part of that country. The forest spread from the Bleached Hills in the north, all along the flanks of the Bergrucken and Rhodope Mountains in the east and west, to the swamps of the south and the Amber Sea. It was deep and dark, and the abode of Tefnut and a host of the Val Eahrakun. Amenut made his house there, as did Nunt of the Deep Pool and Heth, the servant of Toth. At that time a warrior-priest named Aedgen led the Ethrum. After meeting the dwarves, he turned his people south, for the Ethvold seemed a welcome home to them. It harkened to their abodes in the northern forests and promised shelter from the giants and dragons that hounded them. Coming to the headwaters of the Ardeen River, Aedgen ordered his people to make camp so that he might explore further and find a good place for them to settle and build homes. He traveled by boat, bringing with him a small company of rangers led by his brother Areos, and a company of soldiers led by his youngest brother, Kayomar. They followed the river down its southern way, exploring and mapping as they went. After many weeks they came to a bend in the river that led into a deep valley surrounded by stark cliffs and mountains, until at last they came to the confluence of two rivers and a mighty falls. Aedgen and his followers camped and explored the adjacent lands, and pondered how best to master the falls. It was Areos who found a way to pass over them, and he brought them to the lower river safely. 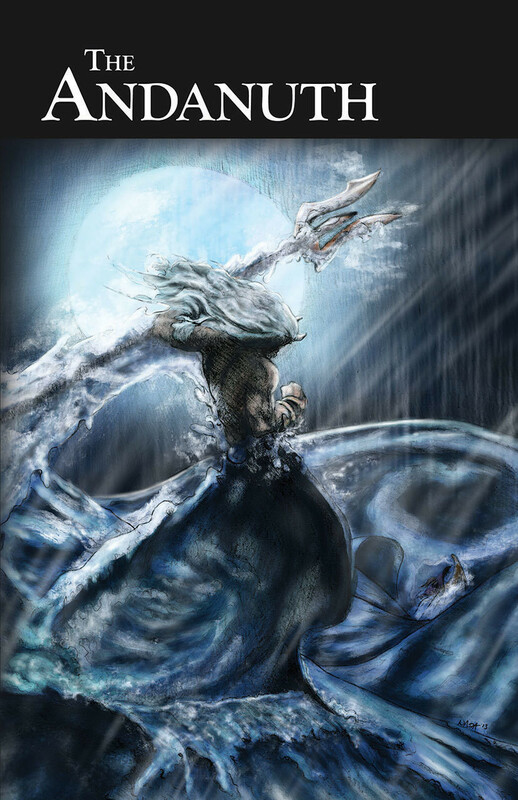 It was then that tragedy struck, for they came upon a creature of ill intent, and it rose from the waters and fell upon the company, slaying many and dragging Areos to the bottom of the river. Aedgen alone with his younger brother Kayomar, escaped, washed ashore south of the cliffs. They stood upon the edge of the Ethvold, alone and unarmed, with no way to return to their people. They could not go back up the river for the course was too strong. To the east was a wild and wicked land that promised long journeys. So they struck out into the deeps of the western road, into the Ethvold Wood. They hoped to move north and return to their people, but there were no roads, and the tracks of the wild beasts led them ever deeper into the long valleys. Here Kayomar met his end, for the pair stumbled upon a great tusked beast that fell upon them. The brothers fought like lions, with stones and clubs, but the beast caught up Kayomar in his arms and, lifting him high, crushed the air from his lungs. As his bones shattered, the young warrior took the beast by the tusks and pulled with such might that he tore its head asunder. For all his courage, the warrior died of his wounds, and Aegden laid him to rest in the cool earth, and he called that land the Valley of Kayomar, so it was called ever after. Though time has swallowed much of that people, it is prophesied that whoever finds the Tomb of Kayomar, shall be accounted the greatest warrior of their age. After many days, Aedgen stumbled, hungry and tired, upon another river. Broad and swift, it cut its way through the forest in a rocky channel. Trees grew in abundance along its banks, flanked by reeds and water grasses. Coming to the river, he saw the sun for the first time in many weeks and learned that he was heading west, and not north as he had hoped. He was utterly lost, for his brother Areos had been his eyes in the wild. He stood there, upon the river and glared down its length, pondering what course to take. No fear crept into him, only a determination to return to his people before they were lost. It is here that Tefnut found Aedgen. She, alone, of the Val Eahrakun had had no contact with man or dwarf for all the long ages, dwelling as she did in the rivers and forests of her home. She found Aedgen upon the shores of the Tarvish River and was curious. She watched him,until at last she could bear her curiosity no further, and she rose from the waters. She stood thus, without raiment of any kind, a marvel of beauty, and called to him. Aedgen was amazed. Tefnut’s beauty was beyond that of any mortal, and the light in her greater than any he had ever seen. They talked upon the river’s edge, and such was his speech that she became enamored of him. Her voice echoed the deep places of the forest and conjured images of safety and power, and Aedgen loved her in turn. Tefnut nursed him to health and learned all there was to learn of him, his people, and their journey. She guided him, then, to the deep vale of country that lies between the Tarvish and Ardeen Rivers and gave him that land. It was unspoiled by any and he marveled at it. They dwelt there together for a long season. See a preview to right.